Since I’ve been on insulin, I’ve read blog and twitter posts discussing basal rate testing, fasting, recording, etc. I know the proper basal rate testing instructions and worksheets are in my pump manual and it appears in a couple of books I’ve read since then. Since my breast cancer diagnosis, I’ve had so many variables effect my insulin rates and it’s been like juggling chain saws to keep up with it all. I had been wary of changing my rates on my own. My Dr. would do all sorts of calculations and charts and print out my pump and meter records and come up with numbers that would immediately make my days better. I was afraid to take this into my own hands. . but, you learn alot when you have to. During the first four chemotherapy treatments, I wasn’t eating as usual, so I kept crashing. I remember Scott (that devilishly handsome if yet grumpy DOC hero) reminding me that the basal rate should keep your BG level with or without food. I started noticing a pattern in the times of day I would crash and started lowering my basal rates a little at a time so that I noticed my BG leveling off. Just about the time I figured out how to lower my basal rates to keep from crashing, they changed my chemo treatment meds to add steroids. Steroids made my BGs SOAR. The very first night I woke up every two hours trying to chart when the steroids hit my system and how quickly my numbers would rise and when they would come down. At hour 6, it started climbing quickly. By hour 8 I was steadily in the 300’s with corrections not making much difference. I started increasing my basal rate AND using a correction bolus. I finally figured it out that the morning after taking the steroid, my basal rate had to bumped up to 7u/hr to bring my BG down below 200, then 5u/hr to maintain between 180-200. Now, I’m off chemotherapy and I thought I could just go back to my old basal rates prior to my cancer diagnosis. But, there are still variables. I had surgery, a post-op infection, another surgery and now recovery. Surgery is so stressful on your body and I noticed that immediately following my numbers were running rather high. I’m now resting and recovering and my old basal rates are still not working, but I used that as a baseline. I LOVE having my continuous glucose monitor (CGM) to help track the trends in my BG. I was waking up at over 200 every morning. 240-280 was not uncommon. 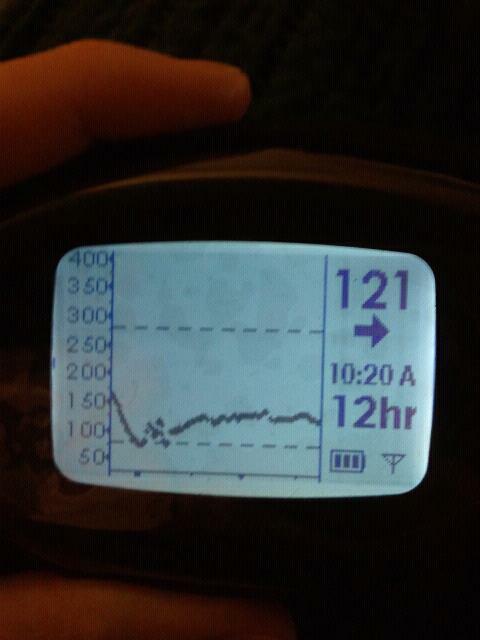 I could look back on the CGM and see that at about 5am, my trend would start rising. I counted how many correction units I needed, divided it by the amount of time between 5am and my waking and then added that into my basal rate. I’ve finally woke up the morning and my BG was 113! I was THRILLED. I now have 4 different settings throughout the day and no matter when I have a chance to eat, I haven’t crashed in quite a while. Because I was first misdiagnosed and had to become my own advocate, I think I was a little more willing to try this experiment on my own. I’ve spoken about this with others in the D.O.C. and have learned that many of you adjust your rates all the time. I think it’s really important for each of us to know our bodies, recognize changes, recognize when the variables change and anticipate corrections that may be needed as you face new circumstances and conditions. If your BG readings are not where you’d like them to be, make sure to discuss this with your CDE or medical professional. I’m not a Dr. so I hesitate in suggesting others play with their rates as I have. But, if your Dr. encourages you to make adjustments, don’t be afraid to try. Mine just asked that I make SMALL changes at a time, no more than .10 of a unit at a time. You can do this.